 The Ulster adult 60x30 Singles finals were played off last Saturday in Kingscourt. 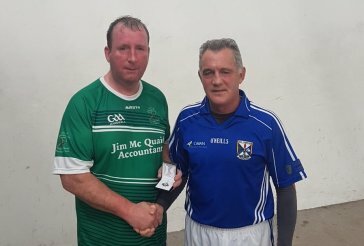 In all, seven finals were down for decision and the large crowd were treated to an excellent day's handball, with all games refereed by Kingscourt HC officials, with Cavan leading the way with three victories on the day. In the first game on the programme, Monaghan's Conor McDonnell (below) defeated Cavan's Michael G Brady in a thrilling three-game clash. Monaghan Harps man McDonnell, who saw off Cavan's Joe Dillon in the semi-final, lost the first 21-11, won the second 21-15 and was well down in the decider before coming through 21-20 in the third, with his trademark left corner kill reliable as ever. The U21 Singles title went to Cavan's Caolán Smith, who defeated Monaghan's Oran Kiernan 21-12, 21-16. Maynooth University student Smith's steady front court play saw him ease to a win in the opener and although he fell 8-1 down in the second, he soon took charge before holding off a late surge from the Carrickmacross right-hander to close it out. 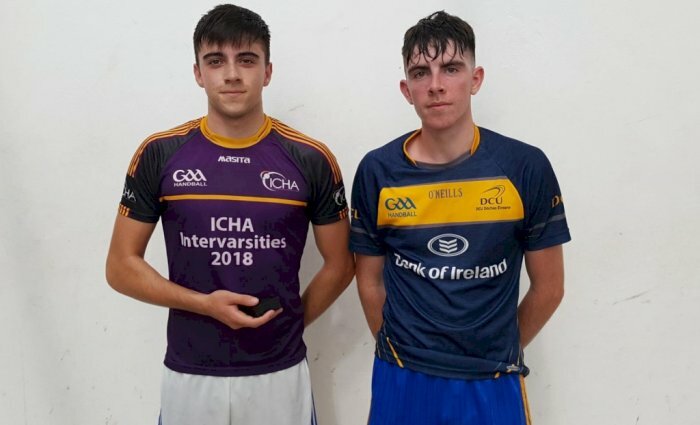 In another Cavan v Monaghan clash, the fast-improving Kingscourt player Cillian O'Reilly defeated Stephen Shanahan 21-7, 4-21, 21-14, with Ryan Mullan landing Tyrone's only title of the day in Intermediate Singles. The Carrickmore clubman ran out a 21-5, 21-16 winner over Cavan's Patrick Clerkin. Monaghan took the SMBS title, with Michael Clerkin defeating Down's Shane Kelly, while the O35BS went to Antrim, Tipperary native Con Collins beating former Cavan minor football captain Brian Reilly. The last game of the day was the Junior Singles, where Paul Fitzpatrick beat doubles partner Cormac McMahon 21-9, 5-21, 21-8.